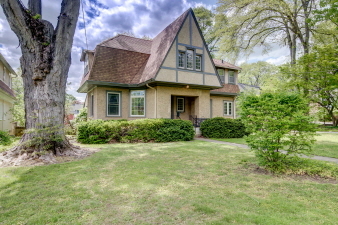 This historic 5 BD, 2.5 BA home features the popular "Gabled Inn" floor plan and was built by Wendell & Smith around 1890. Covered Entrance with open front porch sitting area. Spacious Front Hall has distinctive staircase with stained wood balustrades and charming built-in benches. A private Study/Den/TV Room is nestled to one side of the Entrance Hall. On the other side is the Living Room, which has a gas fireplace with intricate vintage millwork and built-in bookshelves. The Dining Room opens to a Screen Porch which overlooks the tranquil, level rear yard. Several rooms were opened up many years ago to create a spacious Kitchen & Breakfast Room, plus there are rear stairs. Behind the Kitchen is a Mudroom with Laundry and Powder Room plus a closet. Upstairs are 5 BD & 2 full BA, including a private NEWER Master BA which is rare in most historic homes. Ideally sited on a quiet street with minimal through-traffic, this .44 ac. property is in the heart of the historic & friendly neighborhood of North Wayne, which offers many activities year-round. The detached, oversized 1-car Garage, walk-up Attic, & unfinished Basement offer ample storage space. Features of note include oak hardwood & heart-pine flooring, newer windows on the 1st floor, and a waterproofed basement. Convenient to the Blue Route, Airport, & Center City, this home is ideally located within walking distance of schools, train, shops & restaurants in the charming village of Wayne.